You know that gutters protect your home from serious damage caused by rain, snow, ice and debris. You know that undrained moisture can damage a roof and everything it is designed to protect. But did you know that water running from your roof to the ground can damage the foundation of your home or become a breeding ground for pests? Since gutters are an important asset in protecting your home and the valuables within, we want you to consider how important it is to protect the gutters too. At Hamilton Gutter Pros, we are known for providing the best gutter cleaning results in West Chester and Hamilton, Ohio. Not only do we provide the best service but we also provide the best products for our customers which include top quality gutters and the very best protection to keep those gutters functioning like new. Basic gutter guards provide a perforated lid attached to the top of the gutter. In typical use, the gutter guard will prevent leaves and other debris from entering the gutter and clogging the downspout. 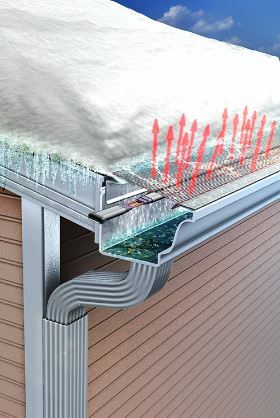 During our winter seasons of heavy snow and freezing temperatures, those perforations do little to protect the gutters from ice and packed snow. ​Our crew at Hamilton Gutter Pros is proud to offer gutter heaters to help you combat the ravages of winter. For better drainage, the heated gutter helmet incorporates a patented nose forward design that allows debris to fall to the ground as maximum water is captured and directed through the heated gutters and downspouts quickly draining moisture before it can accumulate and freeze. Professionally installed with heavy duty mounting brackets, the heated gutter helmet also includes a Triple Lifetime Warranty for that added piece of assurance. Drainage is good but extra protection against destructive ice is great, which is why we also offer gutter heaters. Our heated gutter helmet is a self-regulating, heating cable that is installed beneath your gutter cover so the cable and attachments remain out of sight. With a flick of a switch, you can have heated gutters whenever you see a build-up of ice or snow. Because you control usage, the heated gutters cost is minimum, unlike the options of installing other gutter heaters that run continually. If you would like an estimate for the cost of installing heated gutters, just give us a call for a free inspection. Assessing the size of your home, the condition of your roof, type of roofing, etc will assist us in supplying an accurate quote. Heated gutter guard reviews praise our system as an “easy installation with great customer service” and “a perfect solution to my winter gutter problem.” Heated gutters installed by our friendly technicians is growing in popularity. You may have already seen our crew installing heated gutters and downspouts in one of the homes in your neighborhood. Don’t tackle frozen gutters this winter and risk the big chance of injury or property damage. Give us a call now and we can discuss the perfect option for you.